Sevens and Stripes is a neat little game which does not have a huge clutter of bonus multipliers, wild symbols, or mini-games. Though these additional features are fun to play, sometimes you just wish to play a good old classic slots game. This game has an optional progressive jackpot which can be accessed by even those playing on a budget. 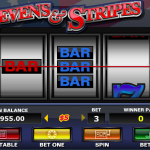 Sevens and Stripes was created with a simple design to make things easier for the players. That is not to say that the game is not attractive. There is also a progressive jackpot which awards the players as much as 10,000 coins. You can claim the jackpot when you line up one of blue 7, red 7, and white 7 each. Even if you are not lucky enough to get these three icons, you can still win 4,800 coins with 2 coins and 2,400 coins with 1 coin. A mixed combination of Single, double and triple bars also give you payouts worth 4-12 coins. 3 single bars will get you between 10-30 coins, 3 double bars will get you between 20-60 coins, and 3 triple bars will get you between 40-120 coins. Hitting 3 blue 7’s will get you 100-300 coins, 3 white 7’s will get you 200-600 coins, and 3 red 7’s pay 1,199 – 5,000 coins. You need to play with all three coins, even if you use smaller coin sizes, in order to be able to win the jackpot. 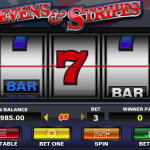 Sevens and Stripes is a game by RTG that offers a good payout. It has an all-American Stars and Stripes theme where the stars have been replaced with 7s – the Lucky 7s! 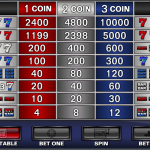 The game has a red, white, and blue color scheme with 3 reels and 1 pay line. The game undergoes third-party audits as well. For another great and engaging game you should consider playing Ronin a 5 reels slot by RealTime Gaming.